The Alliance of Radical Booksellers (ARB) is delighted to announce that the winner of this year’s Little Rebels Children’s Book Award is Gillian Cross for her book, After Tomorrow (OUP). Commenting on the winning book, Little Rebels judge, Wendy Cooling, said, “This is a frighteningly believable story, a real page-turner with a strong sense of danger always present, and many big issues of a possible future just below the surface”. Kerry Mason, Co-Director of Letterbox Library who administer the award, added “In this, the 2nd year of the Little Rebels Award, the shortlist was stronger than ever. However, Cross’ imaginatively executed tale was praised by the judges for unsettling our expectations and for encouraging young minds to tackle big ideas – in this story, starvation, civil conflict and the need for asylum are firmly located in the heart of Britain”. The Little Rebels Children’s Book Award winner was announced at the London Radical Bookfair (May 10th), Bishopsgate Institute, London. Earlier in the day, Wendy Cooling chaired a panel discussion with Little Rebels shortlisted authors, Deborah Chancellor (Real Lives: Harriet Tubman), Gill Lewis (Moon Bear) and Geraldine McCaughrean (The Middle of Nowhere). This year, an additional radical children’s literature panel was held, entitled ‘Where are all the little rebels?’ The panel was chaired by Ann Lazim, co founder of the UK section of IBBY along with Professor Kim Reynolds who also joined the discussion alongside children’s authors Alan Gibbons and Catherine Johnson. The speakers explored the world of children’s literature in relation to radical thinking and political activism. Catherine Johnson said, “I think the best children’s literature always has a bit of radical about it- from Dr Seuss and Philip Pullman to Malorie Blackman- the best stories are always pushing at the boundaries”. This event was held in commemoration of children’s author and Morning Star Literary Editor Robert Leeson (1928-2013). The Little Rebels Children’s Book Award is now in its 2nd year. It is given by the Alliance of Radical Booksellers and administered by specialist children’s booksellers, Letterbox Library. The award recognises children’s fiction for readers aged 0-12 which promote social justice. Photos of the event at Conway Hall will be available from midnight on Saturday May 11th ; please contact ??? The 2014 Little Rebels Shortlist (for books published in 2013): Moon Bear by Gill Lewis (OUP); After Tomorrow by Gillian Cross (OUP); Real Lives: Harriet Tubman by Deborah Chancellor (A&C Black); Stay Where You Are by John Boyne (Doubleday); The Middle of Nowhere by Geraldine McCaughrean (Usborne); Rosie Revere, Engineer by Andrea Beaty, illustrated by David Roberts (Abrams); The Promise by Nicola Davies, illustrated by Laura Carlin (Walker). Letterbox Library is a 31-year-old, not-for-profit, children’s booksellers and social enterprise. They specialise in children’s books which celebrate diversity, equality & inclusion. Further information can be found at www.letterboxlibrary.com Letterbox Library administer the Little Rebels Award on behalf of the ARB (see below). The shortlist has been announced for the Little Rebels Children’s Book Award for radical children’s fiction. Now in its 2nd year, the shortlisted 2013 titles are: Moon Bear by Gill Lewis (OUP); After Tomorrow by Gillian Cross (OUP); Real Lives: Harriet Tubman by Deborah Chancellor (A&C Black); Stay Where You Are by John Boyne (Doubleday); The Middle of Nowhere by Geraldine McCaughrean (Usborne); Rosie Revere, Engineer by Andrea Beaty, illustrated by David Roberts (Abrams); The Promise by Nicola Davies, illustrated by Laura Carlin (Walker). The shortlist was announced at a special event hosted by Housmans Bookshop on Saturday evening (29th) and followed a panel discussion, chaired by Letterbox Library, on B.J.Epstein’s new book, ‘Are the Kids All Right? : The Representation of LGBTQ Characters in Children’s and YA Lit’ (HammerOn Press). The Little Rebels Children’s Book Award recognises fiction for ages 0-12 which promotes or celebrates social justice and equality. It is given by the Alliance of Radical Booksellers (ARB) and is administered by specialist children’s booksellers, Letterbox Library. The judges Kim Reynolds (Professor of Children’s Lit Newcastle University), Wendy Cooling, (Bookstart co-founder & editor) and Elizabeth Laird (children’s author) will be meeting in early April to discuss the shortlist. Speaking about the award, Kim Reynolds, author of Radical Children’s Literature (Palgrave MacMillan: 2010) said, “Little Rebels is the most recent manifestation of an honourable but for the most part over-looked tradition in children’s publishing that uses stories to celebrate human rights, equality [and] diversity…Often transforming society requires bold thinking and bold action, and so this prize focuses on books that help readers become the kind of ‘little rebels’ who one day will catalyse social change rather than carrying on in the same old ways regardless of the costs and consequences”. This year, the winner of the Little Rebels Award will be announced at a new event, The London Radical Bookfair and Alternative Press Takeover 2014. This will take the form of a mass ‘occupation’ of Bishopsgate Institute, London on May 10th. It is a free event, organised by the Alliance of Radical Booksellers (ARB) in partnership with the Alternative Press Fair. Nik Gorecki, Bread & Roses Trustee said of the event, “our combined efforts should make for a wonderful event”. The Little Rebels winner will be announced alongside the ARB’s sister adult award, Bread & Roses. Letterbox Library is a 31-year-old, not-for-profit, children’s booksellers and social enterprise. They specialise in children’s books which celebrate diversity, equality & inclusion. Further information can be found at www.letterboxlibrary.com They administer the Little Rebels Award on behalf of the ARB (below). The ARB is a supportive community for the UK’s radical booksellers; www.radicalbooksellers.co.uk. Members of the ARB include Housmans Bookshop, Gay’s The Word, News from Nowhere, Freedom Bookshop and Letterbox Library. The ARB runs the Bread & Roses Award for Radical Publishing, administered by Housmans Bookshop. This independent prize for adult non-fiction ran for the first time in 2011. For more information go to www.bread-and-roses.co.uk . Full details of the award, including the shortlist and prize giving ceremony for the previous year, can be found at: www.littlerebelsaward.wordpress.com . Hosted by the ARB, this fair was run for the first time on May 11th 2013. The fair included 50 book stalls and 20 guest speakers- full details at: www.londonradicalbookfair.com . The winner of both the Little Rebels and the Bread & Roses Awards will be announced at the ARB’s London Radical Bookfair & Alternative Press Takeover at Bishopsgate Institute, London, on Saturday May 10th 2014. The Alliance of Radical Booksellers (ARB) is delighted to announce that the Little Rebels Children’s Book Award for radical children’s fiction is back for its 2nd year. The award is given by the Alliance of Radical Booksellers (ARB) and is administered by specialist children’s booksellers, Letterbox Library. The closing date for nominations is January 13th 2014. This year, Kim Reynolds will be joining the Little Rebels guest judges. Speaking about the award, Kim Reynolds said, “Little Rebels is the most recent manifestation of an honourable but for the most part over-looked tradition in children’s publishing that uses stories to celebrate human rights, equality, diversity, and efforts to transform society in ways that are inclusive and sustainable…Often transforming society requires bold thinking and bold action, and so this prize focuses on books that help readers become the kind of ‘little rebels’ who one day will catalyse social change rather than carrying on in the same old ways regardless of the costs and consequences”. Kim Reynolds is the author of the award-winning Radical Children’s Literature (Palgrave MacMillan: 2010). She is a Professor of Children’s Literature at NewcastleUniversity and is the former President of the International Research Society for Children’s Literature. She will be joined by the 2012 Little Rebels guest judges: award-winning children’s author, Elizabeth Laird and Bookstart co-founder, editor and Eleanor Farjeon Award recipient (2006), Wendy Cooling. The Little Rebels Children’s Book Award is a sister award to Bread & Roses, which recognises radical adult non-fiction published in the UK. Both awards are the inspiration of the Alliance of Radical Booksellers, a network of radical booksellers in the UK. Both prizes will be presented at the 2nd London Radical Bookfair on Saturday May 10th 2014, Bishopsgate Institute, London. 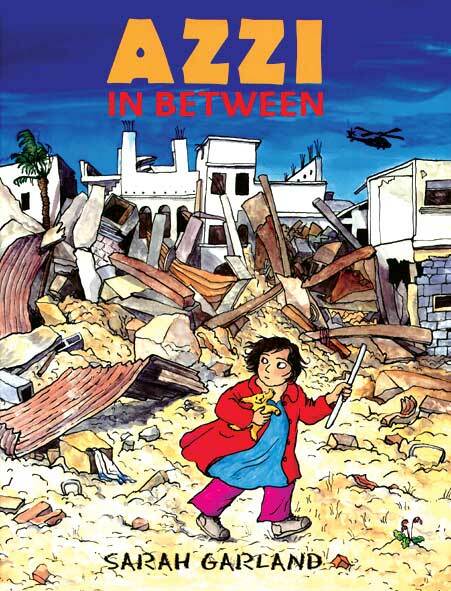 The 2012 Little Rebels Winner was Sarah Garland for her Amnesty-endorsed graphic novel, Azzi In Between (Frances Lincoln). Other shortlisted titles were Hans and Matilda by Yokococo (Templar/Bonnier), Wild Child by Jeanne Willis (author) and Lorna Freytag (ill.) (Walker) and The Terrible Thing That Happened to Barnaby Brocket by John Boyne (Random House UK: 2012). The Little Rebels award will be administered by the 30 year old, not-for-profit, children’s booksellers, Letterbox Library. Co-director, Fen Coles, said of the award, “We’re very proud of the success of Little Rebels so far and we look forward to seeing which ‘little rebels’ will be in the running for 2013.” Nik Gorecki of Housmans Bookshop and co-ordinator for the ARB said, “It’s great to see interest in the Little Rebels award growing and with the prize ceremony being the keynote event in a week-long radical politics programme at the Bishopsgate Institute we expect an even wider audience to become engaged this year”. The closing date for nominations for the Little Rebels Award is Jan 13th 2014; the shortlist will be announced in April 2014; the winner will be announced at the ARB’s London Radical Bookfair on Saturday May 10th 2014. The Alliance of Radical Booksellers (ARB) is delighted to announce that the winner of the inaugural Little Rebels Children’s Book Award is Sarah Garland for her book, Azzi In Between (Frances Lincoln). Commenting on today’s announcement, guest judge and children’s author Elizabeth Laird said, “Azzi tells a simple and powerful story, one with which we should all be tragically familiar, with a text and pictures that are rich, appealing and satisfyingly detailed”. Booktrust founder and guest judge Wendy Cooling added, “The graphic novel style gives it freshness and immediacy. The text and illustration work together brilliantly as they invite children to enjoy the story and to think about the lives of other children”. In a marked departure for the author, best known for her warm narratives of family life, Azzi In Between is in a graphic format and tells the powerful story of a family forced to flee their homeland and settle in a strange and unfamiliar country. The book is based on the author’s own experience of working among refugee families and is endorsed by Amnesty International. Kate Kellaway of The Observer described Azzi In Between as “a masterpiece”. Fen Coles, director of Letterbox Library who administered the award, said, “At a time when there are so many damaging myths circulating about refugees and asylum seekers, it is heartening to see a book which tells the truth- and in a way which children can relate to”. The Little Rebels Children’s Book Award winner was announced today at the first London Radical Bookfair, convened by the ARB and held in Conway Hall, Red Lion Square, London. Wendy Cooling, Booktrust founder and guest judge, presented Sarah Garland with a cheque and a framed picture created by Guardian cartoonist, Ros Asquith. Earlier in the day, Wendy Cooling chaired a discussion on ‘progressive children’s writing’ with two of the shortlisted authors, Sarah Garland and Jeanne Willis. Elizabeth Laird described Willis’ shortlisted book, Wild Child (Walker) as “a truly radical work, celebrating freedom and originality on every page”. The two other shortlisted titles were John Boyne’s The Terrible Thing that Happened to Barnaby Brocket (Corgi Children/Random House UK) and Yokococo’s Hans and Matilda (Templar Publishing). The Little Rebels Children’s Book Award (www.littlerebelsaward.wordpress.com) is a new award given by the Alliance of Radical Booksellers and administered by specialist children’s booksellers, Letterbox Library. The award recognises children’s fiction for readers aged 0-12 which promote social justice and is the brainchild of Nik Gorecki, Housmans Bookshop; speaking about the award, Nik said, “The Alliance of Radical Booksellers is working hard to promote radical publishing and children’s books are an important element of that. There’s still lots of plans in the pipeline for the future and next year we hope to introduce a category for teen readers”. The Little Rebels Children’s Book Award is run parallel to the ARB’s award for radical non-fiction for adults; guest judges for the adult award include Nina Power and former London Mayor, Ken Livingstone. Additional Images: attached is a cartoon image donated to the Little Rebels Award by Guardian cartoonist, Ros Asquith- a framed copy of which will be given to the winner each year alongside a cash cheque. The shortlist has been announced for the new award for radical children’s fiction, The Little Rebels Children’s Book Award. Shortlisted 2012 titles are: Azzi In Between by Sarah Garland (Frances Lincoln), Hans and Matilda by Yokococo (Templar/Bonnier), Wild Child by Jeanne Willis (author) and Lorna Freytag (ill.) (Walker) and The Terrible Thing That Happened to Barnaby Brocket by John Boyne (Random House UK: 2012). The Little Rebels Children’s Book Award recognises fiction for ages 0-12 which promotes or celebrates social justice and equality. It is given by the Alliance of Radical Booksellers (ARB) and is administered by specialist children’s booksellers, Letterbox Library. Guest judges Wendy Cooling, (Bookstart co-founder & editor) and Elizabeth Laird (children’s author) will be meeting next week to discuss the shortlist. The winner of the inaugural award will be announced at the new ARB London Radical Bookfair to be held on May 11th at Conway Hall, London. The winner will receive a cash prize and a framed print by children’s author/illustrator and Guardian cartoonist, Ros Asquith. The print has been especially created for the award and features little rebels waving banners, including child-friendly slogans such as “Save the Whale, Save the Snail”. The Little Rebels Children’s Book Award will be marked by a panel discussion on ‘progressive children’s literature’ which will be chaired by Wendy Cooling and will include author Sarah Garland. The winner of the sister award for adult non-fiction, The Bread and Roses Award for Radical Publishing, will also be announced at the bookfair- 8 titles have been shortlisted and will now be judged by author and lecturer, Nina Power, former London Mayor, Ken Livingstone and author, Laura Oldfield-Ford. Kerry Mason, Co-Director of Letterbox Library said of the Little Rebels Children’s Book Award, “we were surprised and delighted by the many publisher submissions we received for Little Rebels. There is a real excitement and buzz about the award which we hope to build on for next year”. She added, “Hard economic times can sometimes lead to publishers sticking to safe and tested book series and reprints. It is heartening to see that even when the going gets tough, some UK children’s publishers are still happy to take risks, to stay creative, to venture out into the unusual and deliver us thoughtful, provocative and radical yarns. This wonderful shortlist includes the true-to-life story of a refugee family, an anarchic feline adventure, an untamed & unkempt child within a visionary picture book and a protagonist who has no business being ‘ordinary’”. Nik Gorecki of Housmans Bookshop and co-ordinator for the ARB said, “Book prizes tend to gravitate towards the conservative. I imagine partly this is due to a culture formed of corporate sponsorship, but also a more general conformism. The two ARB book prizes are free from such pressures- the prizes being administered by bookshops reverses the usually top-down nature of such awards”. Keep updated on the Little Rebels award by following @LetterboxLib / @ARB_information. Nominations are now open for a new radical children’s fiction award: The Little Rebels Children’s Book Award. The award is given by the Alliance of Radical Booksellers (ARB) and is administered by specialist children’s booksellers, Letterbox Library. The closing date for nominations is January 11th 2013 and the winner will be announced in May 2013. The new Little Rebels Children’s Book Award has been built on the success of last year’s Bread & Roses Award, which recognises radical adult non-fiction published in the UK. Both awards are the inspiration of the Alliance of Radical Booksellers, a network of radical booksellers in the UK. Members of the ARB include Housmans Bookshop, Gay’s The Word, News from Nowhere, Freedom Bookshop and Letterbox Library. Guest judges for the Little Rebels award have been confirmed as children’s author, Elizabeth Laird and Bookstart co-founder and editor, Wendy Cooling. Ken Livingstone joins the team of judges for the adult award this year. Both prizes will be presented at a radical bookfair at Conway Hall, London, on May 11th 2013. Closing dates for nomination for the Little Rebels Award is Jan 11th 2013; the shortlist will be announced in March 2013; winner will be announced at the ARB bookfair, Conway Hall, London on Saturday May 11th 2013.